■ October 10th, 2015 Found a remodeling contractor! Actually, I sent out messages on Twitter to a remodeling and DIY contractor that I met through Twitter. I haven’t greeted them yet in person, but they are willing to come to a sight inspection with me and provide consultation of the interior. How nice! Personally, I think the opportunity “to meet a company on Twitter” is one of the most important things. The business via the Internet is important to let the net citizens know only from pictures and sentences. I’m thinking about reserving a hostel mainly via our website, so I wanted to ask a person who uses those kinds of media really well. He was using Instagram and Twitter to express how renovation and DIY are fun. ■ October 11th, 2015 I told my image of the website! Although it was Sunday, Mr. Ippei, a web designer, made time for me to have a meeting. He lives a stoic lifestyle and I wonder what drives him like that. When does he go to sleep…? I see him as my senior because he’s not a salaried worker. He also likes to travel. He was interested in my business this time because he thought “this may become an opportunity to expand relations to sightseeing business.” He listened to my story carefully and positively. I talked with him about things which I’m particular about relating to the website. ■■■ I really think the website is very important. ・Website is everything to attract our guests around the world. 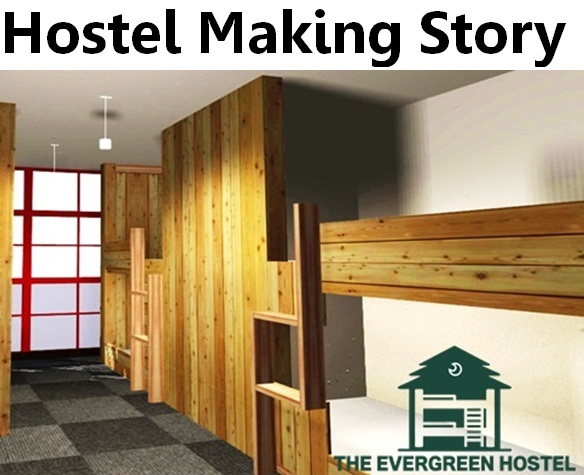 ・But still, I don’t want our guests to feel like “this hostel is not so good as it looks.” So I have to create the hostel with this idea in mind. 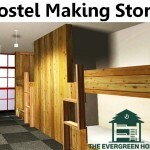 ・It’s important that the hostel is stylish, but it has to be functional in the first place. ■■■ Simplify a reservation form. ・It sickens people if the form were to fill in every single thing. It has to be useful. ・For us, reducing the routine work is very important. ・As soon as someone books online, I want the website to reflect the remaining number of beds automatically, which means I want to avoid counting beds that are still empty by myself. ■■■ There are Facebook, Twitter, blog, etc. to attract our guests around the world, but how can I combine them? ・I can’t use them all. I wonder how I can combine them well. 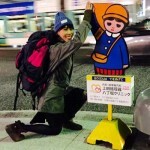 ・As a special topic, I want to post the interviews of “Evergreen People” (of course people who said OK to post) on the blog. The first meeting finished by telling him whatever I wish for the website. I hope he understood the things I want. Let him make a professional-looking website♪ Lol.